Breaking into the music business is no easy feat, but an unfiltered, in-your-face attitude helped rapper Cardi B. rise to the top of the charts with her hit single “Bodak Yellow.” The Bronx native has that same risk-taking, no-holds-barred attitude when it comes to her nail art. Just ask long-time manicurist and friend Jenny Bui, who has varnished Cardi B.’s tips for the past five years. “She’s always been into nail art and loves a lot of bling,” Bui says, noting that the first manicure she ever created for the rapper was decked out in Swarovski crystals. Since then, Bui, a 21-year nail tech and owner of Harlem, New York-based Nails on 7th Ave., has created a myriad of wild looks for the hip-hop performer, ranging from oversized, piled-on gems to lengthy stiletto tips featuring tiny photos of Cardi B.’s rapper boyfriend Offset. 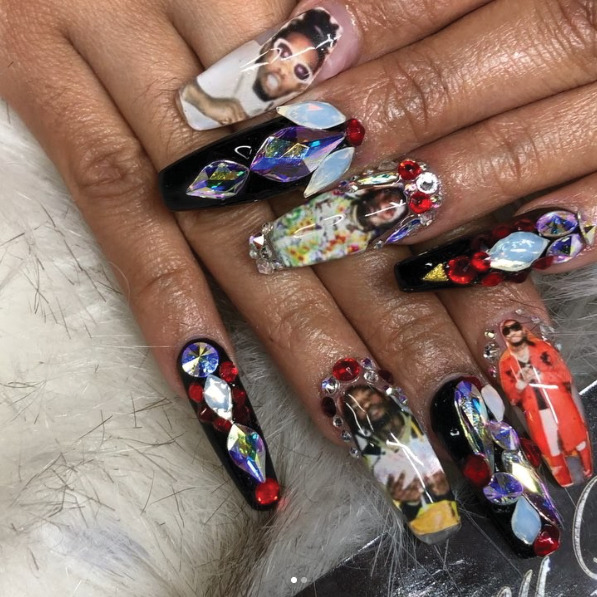 When it comes to brainstorming Cardi B.’s nail designs, Bui says it’s a collaborative effort, noting, “Sometimes she tells me what she wants, but oftentimes she lets me be creative.” If the rapper’s Instagram feed is any indication, the two make an exceptional team, as Cardi B. posts “nailfies” on a regular basis and always shouts out her favorite tech.